It is a little ironic. Going viral with a post about hidden depression. I both was and wasn’t surprised. 3 weeks ago, I wrote the Perfectly Hidden Depressed Person post (PHDP). There was an extraordinary response. I thought my laptop had some sort of strange illness. It was a little nuts. The post ended with a little over 1.3k Facebook likes. Over 100 shares. Thank you for that. I wasn’t surprised by the private messages I started receiving. “I was going to hurt myself. And then I read this. I am going to talk to my family tonight“. 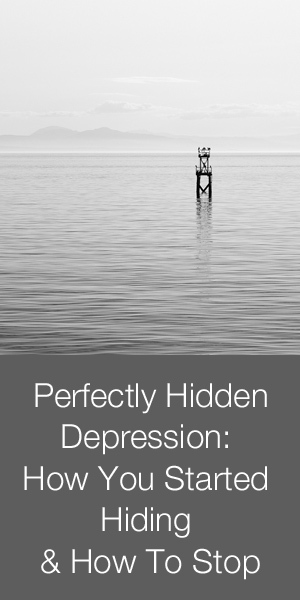 “I can’t even put into words how much I cried on the inside when I read about the perfectly hidden depressed person“. 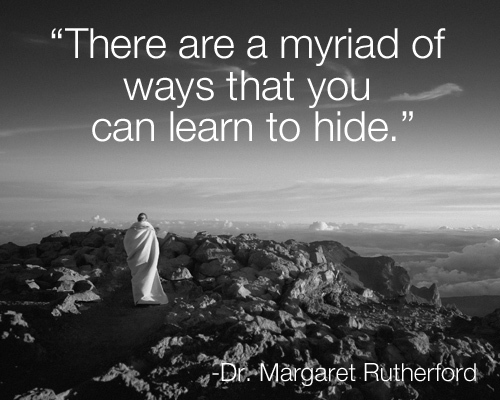 There are a myriad of ways that you can learn to hide. Perhaps you were abused as a child. It was at that point you began hiding your pain. You were told to shut up. Keep the secret. You have simply continued the practice. You never talk about what is really going on with you. What hurts you, what angers you. Or you were a child of alcoholics. You learned to be hyper-vigilant. You kept your feelings completely to yourself because it was far from safe to communicate them most of the time. Children react differently in this environment, but a PHDP might become invisible to their parents to protect themselves. They stay invisible as adults. Morph themselves into who others need them to be. Perhaps you are male and were told that it is unmanly to admit any kind of vulnerability. This is still extremely common in our culture, believe it or not. You put up a huge front of stoicism. Perhaps you were reared in a family where the dominant belief was to always look perfect to the outside world. To never admit to anyone that there were painful problems on the inside. Any pain of any kind. To keep up the pretense at all costs. Not a hair out of place. Ever. “Don’t air your dirty laundry in public”. Maybe your family never talked about anything much at all. Feelings just didn’t exist. You don’t have to be a victim to talk about your vulnerability. Your sadness. Your anger. It doesn’t discount your strength. Or your competence. One of the things I hear almost on a daily basis? “I hate to cry“. For some reason, we have associated tears with being fragile. With breaking down. With losing face. “Tears are about intensity. Not weakness“. You might cry, or want to cry, when you feel something deeply. Anguish. Pride. Fear. Fatigue. Joy. It’s not innately about being weak. Folks who cry all the time? Okay. There is a problem there. But that’s not the vast majority of the population. Some people have so detached from their feelings, they don’t allow themselves to cry. Or they are using substances that help them detach. Or they are addicted to work , to food, or some other activity that distracts them from whatever might cause them to feel. Some of those folks are hiding. If you are hiding your depression, all you have to do is find 1 person. 1 person to trust. 1 person that you believe has the capacity to hear your story. Will take the time to listen. Try to understand. That’s where you start. To let someone see the real you. If you cry, it’s okay. It’s not weakness. It’s connection. If you enjoyed reading this post, please send it on! And SUBSCRIBE using the gray box above – that lets me know how many folks really are interested in me continuing to write this blog! As always, I so appreciate you taking your time to read and comment! And if you have any private comments or questions, you can email me at askdrmargaret@146.66.99.73. I will answer!